Harry D. Gobrecht enlisted as an Army Air Force Flying Cadet, was classified at the Santa Ana AAB, California, had pilot flight training at King City and Chico, California and Ft. Sumner, New Mexico and graduated as a 2Lt in March 1944 with Class 44-C. His combat crew was obtained at Dyersburg, Tennessee shortly after he had completed the B-17 Pilot Training School at Hobbs, New Mexico. The Gobrecht crew was assigned to the 358th BS(H)/303 BG(H). Their first combat mission was in The Floose on 26 November 1944. Thirty-Five additional missions were flown, twenty in Neva-The Silver Lady. The crew's last mission was completed on March 12, 1945. Returning to the United States, 1Lt Gobrecht flew with the Air Transport Command Ferry Division. After completing the ATC Four-engine Transport School, he was assigned to their Pacific Division where he made trips to Hawaii, Guam, Saipan, Okinawa, Japan, China, New Zealand and Australia. He was discharged from active duty in January 1946 and remained in the USAF Reserves, retiring as a Lieutenant Colonel in 1965. Was licensed as a Commercial single and multi engine Pilot. After graduating from the University of Southern California in 1948 ("Go Trojans"), he married his wife Barbara and was employed by the United States Gypsum Company in Los Angeles. He was transferred to the corporate offices in Chicago in 1957 where he became a corporate Vice President, directing the USG Corporation transportation and physical distribution activities throughout the United States, Canada and Mexico. Was a frequent speaker, lecturer and advisor before numerous transportation and logistic organizations, associations, universities, government agencies and other groups. He was: President of the Traffic Club of Chicago and the National Industrial Transportation League; Certified member and President of the Illinois Chapter of the American Society of Traffic and Transportation; Board of Directors member of National Freight Traffic Association and Association of Transportation Practitioners ; President Chicago Chapter Delta Nu Alpha Transportation Fraternity; Chairman of the Traffic Committee of the Gypsum Association; Member of the Union League Club of Chicago and Chairman of the Transportation Group; Chairman Transportation Policy Committee of the Chicago Association Of Commerce and Industry. Was licensed to practice law before the bars of the Interstate Commerce Commission and Federal Maritime Commission. Made frequent trips to testify before and consult with Congressional and White House Committees, the Interstate Commerce Commission, Department of Transportation and other organizations to deregulate the transportation industry. Was author of several books and magazine articles on transportation subject. Compiled the 75th Anniversary History of the Traffic Club of Chicago (1982). Received the two most prestigious national transportation "Man of the Year" leadership awards: Distribution Magazine/National Industrial Transportation League (1982); American Society of Transportation and Logistics (1984). Was recognized in "Who's Who" listings in World, USA, Midwest, Finance & Industry and Railroading & Rail Finance books. 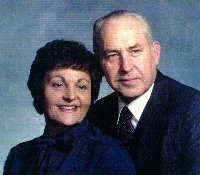 The Gobrecht's have four children - Thomas in Yorba Linda, CA, Sandra in Erie, CO, Richard in Streamwood, IL and Debra in Arlington Heights, IL and eight grandchildren. Harry Gobrecht enjoyed being very active in civic affairs and youth activities during his 30 years living in Mount Prospect, IL. He assisted coaching in Little League football and baseball. Was President of his Boy Scout District, Chairman of the District and Council Camping Committees and Council Order of the Arrow Lodge Advisor. He was honored with the Boy Scout Silver Beaver Award and his wife, Barbara, with the Silver Fawn Award. His two sons became Eagle Scouts and daughter Sandra received the Girl Scout First Class award. Harry and Barbara returned to California following his 1987 retirement, after 40 years service with USG Corporation, and settled in San Clemente, CA. They now enjoy the "world's best climate" and a busy retirement life. Harry is an avid gardner and a member of the Camellia Society and Barbara is an accomplished oil painting artist. Harry is a Past President of the 303rd Bomb Group Association, Inc. (1998-1999) and served as Group Historian and Unit Contact (1991-2003) and developed the 303rd BG(H) Archive collection. He was author of the 926 page 303rd BG(H) history book Might in Flight (1993 & 1997 Editions) that was acclaimed as the most complete and "best" of all 8th AF Group histories and has contributed to the development of the 303rdbg.com website which is now the "best" of any military organization. Became Chairman of Past President's Committee on 11 October 1998 followed by three years as a member of the Past President's Committee. Named the 303rd BGA "Historian Emeritus" - September 2004. Harry also is a member of the following military related organizations: The 8th Air Force Museum at Pooler, GA (Member of the Board of Trustees since 1994 and contributor to its development); The Military Order of the World Wars (San Clemente Chapter Commander 2000, 2001 & 2002); Eighth Air Force Historical Society (Active member); San Diego Flight Order of Daedalians; National Fraternity of Military Pilots; The Military Officers Association of America; Reserve Officers Association; Veterans of Foreign Wars; Distinguished Flying Cross Society; Presented with the annual Mighty Eighth Air Force Museum "Lt Gen. E.G. Shuler, Jr. Award" for outstanding accomplishments, primarily in the field of aviation and in support of Aviation Activities - 9 October 2004. On 20 January 2005 the M8thAF Museum named and dedicated its Research Center the "LtCol Harry D. Gobrecht Family, 303rd Bombardment Group (H) Research Center." Harry passed away August 10, 2010 at his home in San Clemente, California.